I’ve been playing sports since I was 7, like soccer, volleyball, tennis, athletics, and I started practicing combat sports at the age of 15. To earn some money, I used to carry out security roles in night-clubs, often ending up in bad situations. This drove me to look for a means of self-defense. 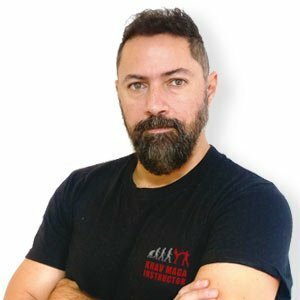 In 2008 I discovered Krav Maga and lucky for me I joined one of the most important federations in the world. I trained and graduated in Israel and in order to be as perfect as possible I decided to become a Women’s and Kids Instructor as well as Civilian. Later, by extending my skills further, I became a Military Instructor at the Foreign Legion. Thanks to the principles of this self-defense system my life did get better in all aspects. Resolution, confidence, emotional control and awareness of a fact: to every problem there is a solution. Krav Maga is not just a self-defense system, it’s a way of life. That’s why I decided to become an instructor and spread this passion. Krav Maga can’t be learnt or taught, it has to be felt.